"I rarely post a trendy recipe while it's still trendy. 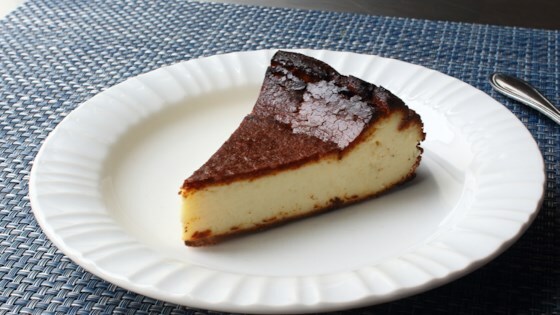 But this 'burnt' cheesecake method deserved the hype; baking it in a very hot oven delivers a beautiful, dark exterior full of bittersweet notes that make the light, creamy cheesecake interior seem even more rich and flavorful. Plus, this method is just plain easier--just remember the parchment paper. So, if you've not had much luck with traditional cheesecake methods, you should stop trying and make this exclusively." Butter a 9-inch cake pan. Cut a sheet of parchment paper large enough to line the inside of the pan by a few extra inches. Butter the paper and press it into the pan, flattening any major creases. Trim away any excess paper from the sides until you have an inch or two of overhang. Combine cream cheese, sugar, salt, and flour in a bowl. Stir and smear together with a spatula until very smooth and creamy. Add vanilla extract and 1 egg; whisk to combine. Whisk in remaining eggs, one at a time. Pour in heavy cream and mix until smooth. Pour batter into the prepared pan. Tap the pan against the counter to burst any excess air bubbles. Bake in the preheated oven until puffed, very well browned, and nearly burned on the edges, 50 to 55 minutes. Increase oven temperature to 425 degrees F (220 degrees C) in the last 10 minutes. Let cheesecake cool to room temperature, at least 25 minutes. Lift out onto a plate and peel back parchment paper, using a knife or spatula if needed. Refrigerate until thoroughly chilled, 4 hours to overnight. 3/4 to 1 teaspoon kosher salt can be substituted for the fine salt. You can use 5 large eggs if you don't have jumbo eggs. Depending on the size of the roll or sheet you buy, you may have to overlap it. The original recipe was developed in the '70s, at a cafe in San Sebastian called La Vina. I adapted it to fit a standard cake pan rather than the large springform pan used in the original.